Satya Nadella, whose son has cerebral palsy, has made Microsoft more inclusive. Imagine telepresence drones cruising through supermarket aisles as your shopping guide, or along beachfronts capturing lush sunsets; headphones that can tune out specific sounds that disorient you; or maybe a tool to order a grande, iced, sugar-free, vanilla latte with soy milk with just your gaze and the right intention. These are the innovations persons living with disabilities dream up constantly and wonder why emerging technology feels so distant from them. Telepresence is already here, so are drones; active noise-cancelling headphones, and recent electroencephalography devices ­– which record electrical activity in the brain ­­– are advancing into efficiently filtering out white noise. 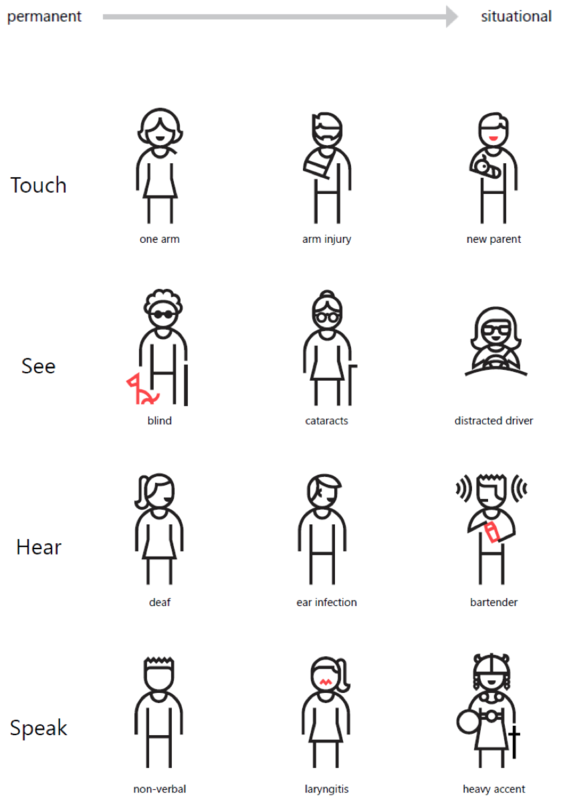 So why do these emerging technologies of the future take so long to benefit people with disabilities? Wider society has always looked at disability as a medical condition, where assistive devices for daily living were seen solely as medical products. As such, there was always a barrier towards designing for disability ­– FDA approvals, patent filings, and perceived zero tolerance of the ‘move fast and break things’ approach. There was a certain fear from innovators that failures in their creations could cost a life and no-one wants that kind of risk and liability without sufficient reward. This is another reason why emerging technology doesn't reach disability fast enough – there isn't sufficient reward for investing in what is seen as a risky and niche market. As such, their non-disabled counterparts indulge in exploring the frontiers of technology, while persons with disabilities wait patiently for the same tech to mature enough to be deemed safe for their use, and widespread enough where extending its reach to disability would be convenient for companies to do so. Singapore is a great example of the trickle-down effect. Consistently ranked as the top spender on innovation in the world, Singapore is the poster child for the Fourth Industrial Revolution. A lesser known fact is that Singapore has two national endeavours: developing a Smart Nation and cultivating an Inclusive Society ­– and those two do not necessarily follow the same path. In an ideal state, we would love to see more social conscience baked into the characteristics of technology and more technology that empowers social causes. However, in Singapore, only a small handful of Smart Nation endeavours involve the collaboration of social service organisations, and only a minute fraction of governmental spending on social welfare is associated with technology. As of now, Singapore has no regulations that require the digital assets of governmental agencies and corporations to be accessible to persons with disabilities. If this continues, what we will see is a widening gulf between those privileged enough to access and be enabled by emerging tech, and the vulnerable groups who risk breeding an aversion to emerging tech, through a lack of access to it. Every year on December 3, we celebrate the International Day of Persons with Disabilities and, in commemoration of this year’s theme ­– “Empowering persons with disabilities and ensuring inclusiveness and equality” ­– I would like to call on governmental bodies across Asia not to be awestruck by emerging technologies, but to look at tech critically to see how it may empower vulnerable groups, such as persons with disabilities. One way to do so is to have more disability representation creating technology, be it as persons with disabilities or persons affected by disabilities, which include family members, friends, and so on. A shining example of this is Microsoft's Satya Nadella, whose introduction as chief executive coincided with the setting up of an in-house Inclusive Design Division, making the Xbox playable with one hand, introducing real-time captioning on Powerpoint, making OneNote accessible to those with dyslexia, developing a 3D soundscape for blind navigation as well as Hearing AI & Seeing AI. Nadella, in his biography Hit Refresh, shares how having Zain, a son with cerebral palsy and legally blind, allowed him to see the value in making products accessible to persons with special needs. However, Nadella didn't single-handedly make this change. Microsoft had always had a strong disability representation among their ranks and him giving them the freedom and resources to explore made all the difference. Apart from representation, another way to redesign societal perception towards disability, is to challenge ourselves to recognise the value in persons with disabilities, and not just see them as beneficiaries of technology, with a sense of sympathy or responsibility. Over a decade ago, the World Health Organisation redefined disability with a more social lens with the Social Model of Disability. Unlike the medical model of disability, which details a certain level of impairment with one’s biological system; the social model of disability states that people are disabled by barriers in society ­– both physical and social – not by their impairment or difference. Whilst there will always be a need for medical assistive devices such as life support machines, surely not everything has to be. Products and services in travel, banking, food and beverage are not life-threatening, but they are life-changing when designed in a fashion that is innately inclusive. In Silicon Valley, companies such as Amazon, Apple, Microsoft and Google have started to value disability. They have started looking towards disability as a source of innovation and an entirely new market opportunity in making their products innately inclusive, yet with a fresh spin that delights everyone. We often look towards nature to inspire us with ground-breaking innovations such as the kingfisher-inspired Shinkansen trains in Japan; octopus-inspired camouflage techniques; or swarm intelligence informed by ant colonies. So why can't we look towards disability for ground-breaking innovation? Being on one end of the human spectrum, the lived conditions of persons with disabilities are markedly different from the neurotypical, non-disabled majority, but at the same time relatable as part of the human condition. By designing for the extreme use case (i.e. disability), its benefits can extend to those who face disabilities in temporary or situational contexts as well. Take, for example, designing for non-verbal communication using visual imagery. While its obvious use case is to benefit the deaf, it also benefits travellers in foreign countries who might be ‘situationally deaf’ to the language of their destination country. Hopefully, as we see the value in disability, so too will we see a rise of persons with disabilities earning their place in the talent pool of technology creators and innovators, instead of being pure consumers and beneficiaries, which in turn increases their representation in technology to close the loop. Hence, with a newfound respect and appreciation for persons with disability as contributors to the innovations that govern our daily lives, one can dream of a future where we will see sustainable, scalable inclusive technology. Because, in the end, it is “Nothing about us without us”.